There is something about little girls and light blue, it can be so feminine and girly too! I love this set so much! Those rolls….need I say more?? This is defiantly one of my favorites from Sloane’s newborn session. The grey drop is by Devoted Knits and the mint drop above is by Roses and Ruffles. The floral halos by Baby Bliss Props are some of my favorite go to’s for girl newborn sessions. Not only are they so pretty, but so easy to get on and off! 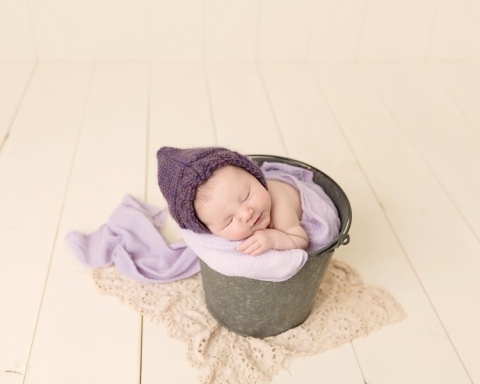 Babies in buckets are always a favorite (and of course it’s fun to say)! It’s so timeless, simple, and sweet! Sloane’s momma loved purple~ I just love how those little cheeks are hanging over the side and that sweet sleepy smile. <3 Couldn’t you just eat her up?? It was so difficult to resist kissing that rosy little face! 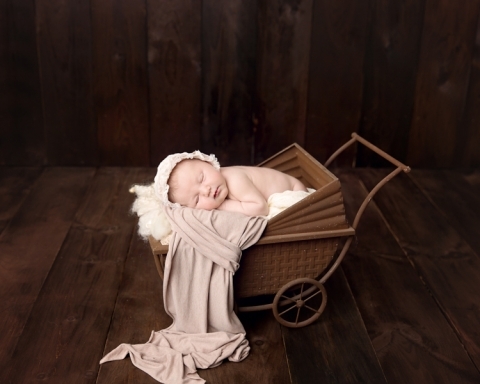 Little Sloane in this little pram- it’s such an uncomplicated set, yet still classic enough for the ages. I always wonder what will happen to these images in the generations to come. Will a pram be a thing of the past? Will their great-grandchildren look back in wonder what life was like? I certainly hope that by providing tangible commodities this work will live long beyond our years! Looking for photography Cleveland? 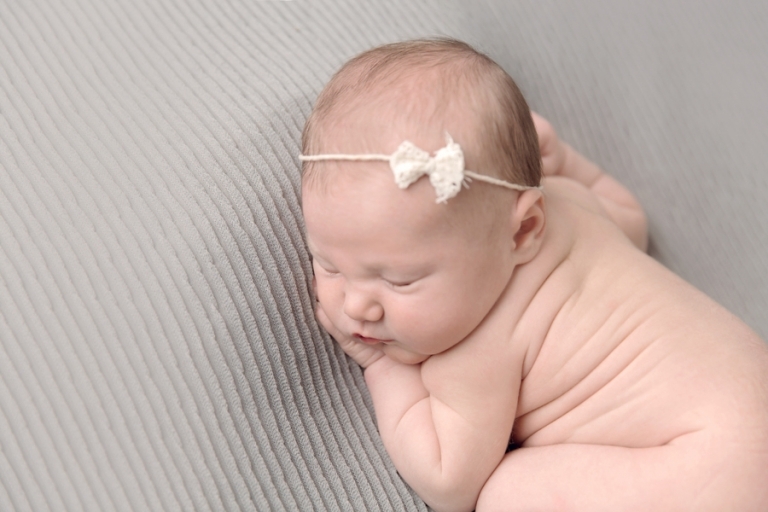 Mary Christine Photography specializes in Newborn Photography Cleveland Ohio. 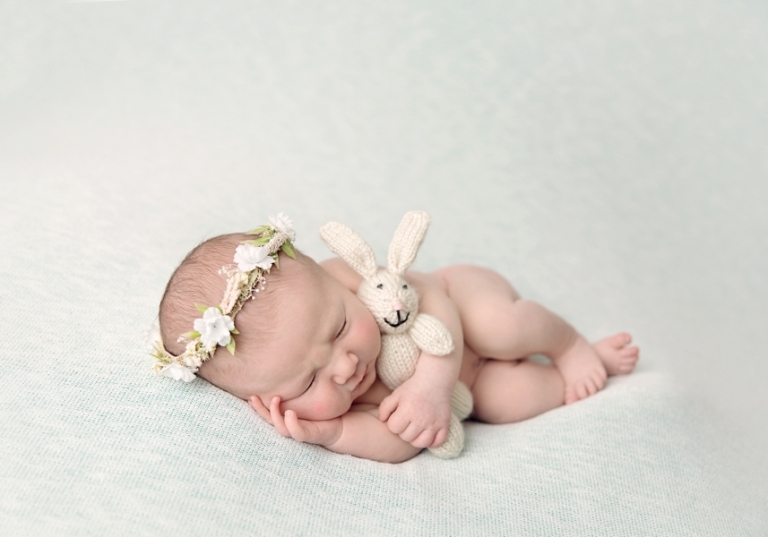 Please visit the newborn portfolio and the newborn session information page to learn more about these sessions. To contact me about scheduling your custom newborn session, please email me at mary@marychristinephotography.com or call 330-241-0424.